We’ve heard the call to action to keep our world green. And now, there is a city that is going ALL green. Or at least it’s trying to. Green technologies, sustainable building materials, solar panels, shaded windows, high-tech wind towers are being tested in Masdar City’s petri dish. Their goal? to be an ecologically sustainable, zero waste city. On a recent trip to Abu Dhabi, Victoria, a Global Adventuress Correspondent, headed 11 miles to Masdar for a private tour of one of the World’s first planned “zero carbon” cities. After parking our “carbon not-free“ mini-van in the outer parking lot to Masdar, we entered Masdar’s City “gate” to a building that houses PRT (Personal Rapid Transit) vehicles. We climbed into the future, an electric powered PRT mini-vehicle. With the touch of a button, the computer navigated the PRT through a tunnel to Masdar. Once we exited and climbed up a spiral staircase to the street level, we arrived to the Masdar Institute where our tour began. As the world faces serious climate and energy issues, many citizens and governments are looking for more ways for sustainable living. In 2007, the Middle Eastern city of Abu Dhabi, one of seven Emirates in the UAE (United Arab Emirates) stepped up to the “carbon free” challenge, to design and build a zero carbon City. What is zero carbon? means not to rely on coal, oil, gas, but be solely sustained with renewable energy (ie. wind, sun, etc. ), void of environmental impact. 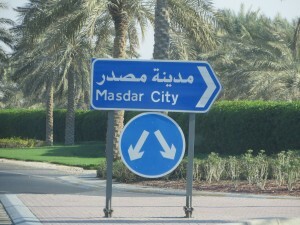 Masdar City means “source city” in Arabic. British Architects Foster and Partner are the master designers of Masdar City. This city will house 40,000 people, 1,500 businesses while delivering the lowest possible ecological footprint and latest technologies for efficient, healthy living. Masdar will be a role model to the world with best practices in sustainable urban planning, design, development and operation. Date for completion is targeted for 2020-2025. How sustainable will Masdar City be? Solar Panels will be placed on rooftops to provide supplemental solar energy totaling 130 megawatts. Concentrated solar power (CSP) plants are also being explored. Plans to host the world’s largest hydrogen power plant. Why is Masdar City Important?The world today faces two undisputed facts that are interrelated and unprecedented challenges: climate change and energy security. There are formidable solutions to these challenges. Through visionary leadership of the UAE, much emphasis is being placed on creating the global platforms required advancing partnerships, reflected in Masdar initiatives. International Renewable Energy Agency (IRENA) headquarters will be based in Masdar. In the near future, this city will be the center for clean tech innovation and companies. As a Professor of Resource Management and Sustainability, I reference Masdar City as a case study for sustainable cities in my classes. While visiting Masdar Institute, we met women and men from different countries in the Middle East, who shared their fabulous experiences of being students there. Most were on full scholarship (tuition and housing paid). I interviewed a group of women graduate students who shared their experiences at Masdar Institute, and the Eco-Housing project they are working on together. It was very inspiring to see female students from the Middle East focused on a sustainable project with such passion for the environment and the work they are engaged in. Our future looks bright!! Click here for more information on Masdar City. To view the frequently asked questions, click here. Acknowledgements: we would like to thank Masdar City for hosting us and giving us a private tour. Opinions in this article are our own. Hi Victoria, I met Kathleen Ronald at a career workshop and she suggested that I contact you about working in the environmental field. I obtained a BA in the environmental field quite some time ago, worked in the field for a short time, and then due to survival needs got into reporting metrics for corporate America. A few months ago I took a class called Uncover Your Calling, since I wanted to change my line of work. Then in May I was laid off. Recently I started volunteering for the CSix Eco Green Group to start networking, and to figure out what is next. http://www.ecogreengroup.org/ Since I am in explore mode now I have no specific questions to ask you, except for the line on your home page regarding “spiritually fulfilling”. That line really got my attention, and if you have time I would like to find out more what that means, and if you would be available in the near future to chat as I explore my next steps. Thank you.